A good Au Jus can do some seriously amazing things to just about any cut of beef, but what it does to prime rib — now that is something truly spectacular. If you’re looking for a simple prime rib Au Jus recipe to take your holiday roast to the next level this year, this is the recipe for you. 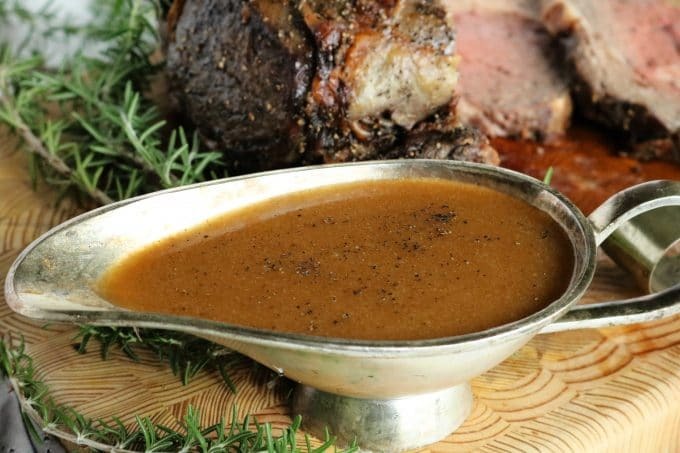 Today, in addition to an easy recipe for the best prime rib Au Jus (one that can be made in less than 10 minutes), we’ll also cover what it is that differentiates it from a stand-alone beef broth and traditional brown gravy, how to make it without beef drippings if needed, why Au Jus seasoning should be kept simple, plus, what you can serve it with…besides prime rib! WHAT IS AU JUS SAUCE? We know how it’s served, but what is it exactly? A classic Au Jus sauce begins with fat. But not just any fat — beef fat. Pan drippings to be more specific. This, in combination with beef broth, gives it an over the top beefy flavor that takes meat to a whole ‘nother level of savory. 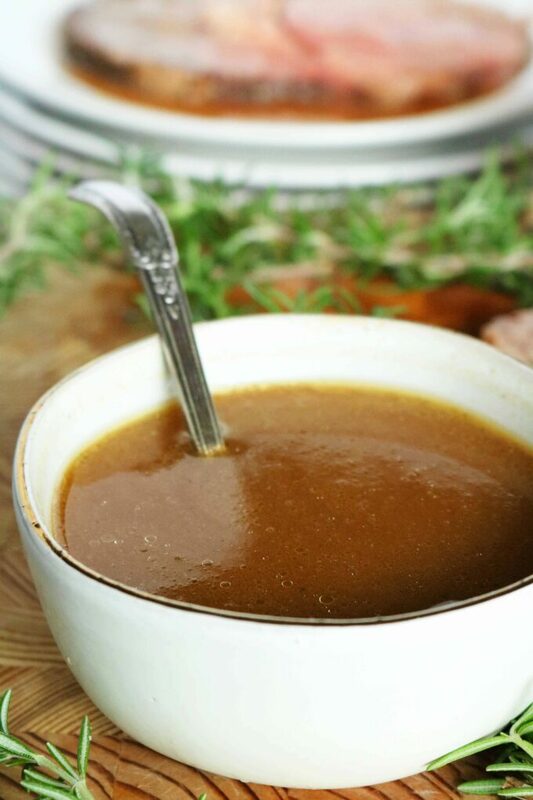 Because Au Jus sauce is thinner than your typical gravy, it is often mistaken for beef broth and nothing more. But, make no mistake — it is more than just broth. Au Jus, like gravy, begins with a fat and a thickener (i.e. flour or cornstarch). However, you’ll find traditional brown gravy to be quite a bit thicker than an Au Jus sauce would be. 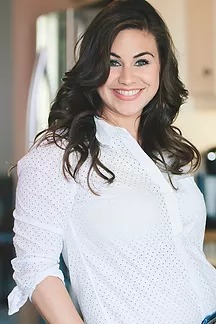 Gravy tends to hold its own as a condiment, clinging to and/or smothering a cut of meat, whereas a good Jus sort of becomes one with meat, enhancing its flavors with beefy goodness, and pouring over the sides. Add beef drippings or butter to a saucepan and melt. Simmer 4-5 minutes to reduce slightly. As previously mentioned, the sauce typically begins with beef pan drippings (i.e. the liquid accumulated in the bottom of a pan from a prime rib roast). See the note below if you do not have any (or enough) pan drippings. If you do not have enough beef drippings, you can substitute butter for the beef fat in your sauce. However, note that beef drippings are preferable as they will intensify the beefy flavor and overall savoriness of your sauce. Once the fat and flour are combined, beef broth is slowly added to the mix, whisking all the while. After all of the broth has been incorporated, the seasoning goes in. The seasoning for Au Jus sauce is as follows: soy sauce, Kosher salt, and black pepper. All of these ingredients will enhance the beefy quality of the sauce. You don’t need to overcomplicate the seasoning when it comes to Au Jus. Its sole purpose is to enhance a cut of meat, not overpower it. Allowing the sauce to simmer will help it to thicken ever so slightly and intensify flavors. This will take 4-5 minutes on the stovetop, and then, it’s time to serve! While Au Jus may not be intended to be a gravy, if you’d like it thicker, you can certainly make that happen. To thicken your sauce further, melt 1 tablespoon of butter in a microwave-safe bowl. Add a 1 tablespoon of flour, and whisk to combine. Then, add about 2 tablespoons of the prepared Au Jus sauce to the butter/flour mixture. Whisk to combine, and add it all back to the saucepan. Bring to a simmer over medium-high heat, stirring until thickened. AU JUS FOR PRIME RIB…AND SO MUCH MORE! 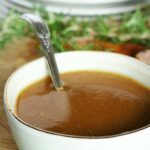 Au Jus is a versatile sauce and wonderful for topping so many things! It’s most definitely a recipe worth getting under your belt…especially when you consider just how seriously easy it is to make. If you’ve got 10 minutes, you’ve got time to take your meaty entrees to the next level with a ladle full of beefy goodness. Enjoy! 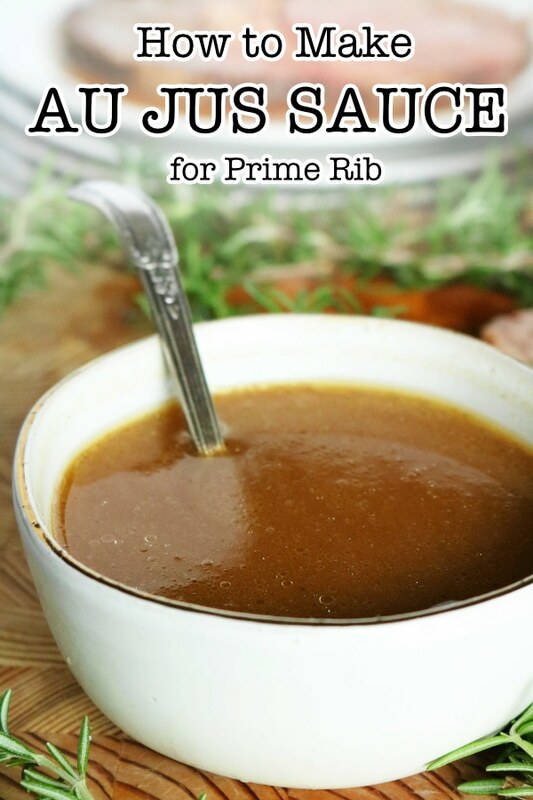 A quick and easy recipe for prime rib au jus sauce featuring beef drippings, beef broth, and a quick simmer. Add the beef drippings (or butter) to a large saucepan over medium heat and all to melt, if needed. Sprinkle the flour over the fat and whisk for 30-45 seconds. Add 1 cup of the beef broth a splash at a time, whisking after each addition. Slowly pour in the remaining beef broth, whisking all the while. Add the soy sauce, Kosher salt, and pepper and increase the heat to medium-high. Simmer for 4-5 minutes, allowing to reduce slightly. Serve and enjoy. Au Jus is so versatile and delicious, it definitely takes a meal to that next level of flavor! Have never heard of it before. You have done a great job explaining the recipe with so many faqs. Thank you so much. 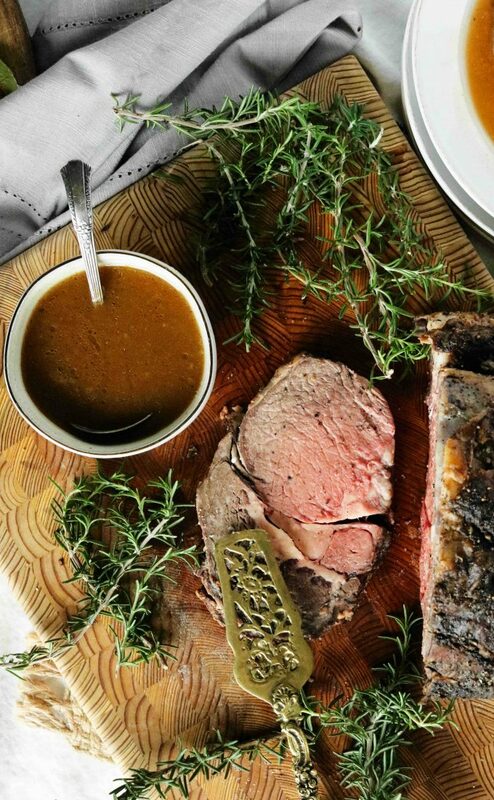 Prime Rib is on the NYE dinner menu, and your Au Jus recipe is the best one I’ve seen. Thanks for sharing! This sounds delicious! Perfect for a Christmas meal! In a nutshell, I want to drink this au jus from a straw! Seriously though, this will be awesome to serve with our holiday beef roast. THANK YOU! I don’t blame you, Bec 😉 Thank you so much! Is it bad that I just want to pick that bowl up and drink the au jus?? Because it looks THAT good!! It’s totally true though how important a good au jus is and I’m loving this tutorial! Ha! Of course not 😉 Thank you so much, Sues! This sauce sounds so full of flavors! Perfect for any meat roast on the Christmas table! we love this type of sauce for our roast beef sandwiches to dip in this looks marvelous! That looks so delicious! I really want some right now! I thought that the au jus served was just beef stock. Great post explaining the difference! Thanks! I’ve only ever seen au jus on restaurant menus – never even considered making it myself! You make it look easy! I really feel I have just learned some interesting stuff! I’ll definitely try to practice everything and I hope I can make some sauce that looks as tasty as yours! This au jus could be used for any holiday meal. Yummy. I had no idea that au jus had soy sauce in it! What a great recipe. Thanks for all the info! This meal is perfection, and that jus must be so flavorful. This recipe is a very nice idea for the Easter Menu. I am pining for doing it later. Perfect for Easter! Thank you, Adriana! Prime rib is my all time FAVE so it’s like this post is made for me thanks so much for sharing! what a great hack with the butter! ill have to remember this in a pinch. Your method for au jus sounds very similar to my pan gravy. I always thought au jus didn’t have any thickener and that it was pan drippings augmented with stock or wine. You’ve taught me something new! Oddly enough, I have never made an Au jus before! Now I have all of the information I need to make my own! Very informative post, as usual! Thanks! Au Juice is delicious. Thanks for all the tips and tricks. Very helpful. Great recipe sounds so full of flavors! Thanks for sharing! This recipe sounds fantastic and so simple. I will be making this for Easter Sunday dinner to accompany my prime rib. Thank you !